It is an anxious time for everyone when a child is ill. The young one questions what is wrong and needs reassurance. Parents are concerned about their ability to protect their offspring and do the best for them. Then there are nights of disturbed sleep, trips to the doctor, possible hospital stays and other breaks to routines. New Lifegain Junior is a high quality nutritional supplement in a shake format designed for such a time. The formulation offers nutritional support to provide children from three to 12 years with additional proteins (soy, milk and whey protein), essential amino acids, fatty acids, vitamins and minerals. It is gentle on the system so it is easy to take if children are in a weakened physical state or unable to eat. 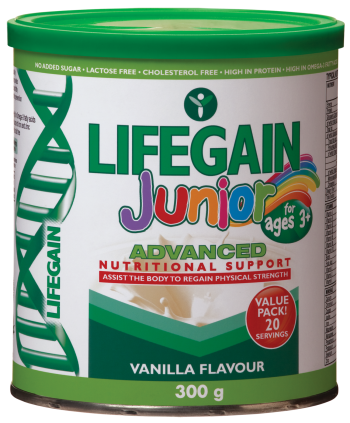 Lifegain Junior is sugar, cholesterol, trans fatty acids and lactose free, but is not suitable for children with soy or milk protein allergy. Healthy children can enjoy Lifegain Junior as a nutritional supplement to support overall optimum nutrition and overall health and well being. Omega fatty acids may support brain function and provide immune support. Energy provision in the daily diet is important for sustained energy during a straining day. Consuming adequate energy may also protect and maintain lean muscle mass. Zinc may offer immune function, enzyme function and anti-viral support. Iron supports red blood cell production. Fibre provides support for the healthy functioning of the digestive tract and the absorption and removal of toxins. Fibre can also assist in providing a more sustained release of energy. Serving size = 15g (one level scoop). Take one serving a day or as prescribed by a healthcare professional. Add 15g (one level scoop) of powder to 100ml of milk or water and blend, shake or stir, mixing until the powder is dissolved. Suitable for children from the age of three to 12 years. Available from Dischems and selected pharmacies at R135 for a 300g tin (20 servings). Typical Nutritional Information only applicable to product when mixed with water. Source of Typical Nutritional Information and Ingredient content claims values is analytical and calculated.